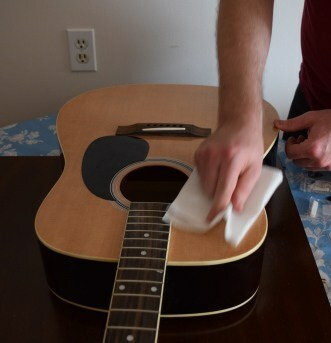 Learning how to clean an acoustic guitar is an important part of caring for your instrument. 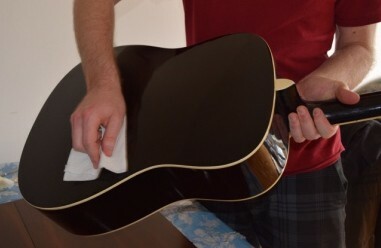 This step by step guide will show you how to clean your guitar including protecting it as you clean. It’s pretty simple really, there are just a couple of things you should know before starting. Probably the most important part of cleaning your guitar is cleaning the fretboard. All the dirt, grime and oil that comes off your fingers can make for a dirty surface which can eventually affect your playing. A dirty fretboard will also mean that your strings will deteriorate quicker, lose their tone quicker and therefore require changing more often. Your frets may also start to show signs of rust at some point but this is also easily remedied. Note: there are some products that you can use on maple fretboards (which are usually on electric guitars) that you definitely shouldn’t use on rosewood and ebony fretboards. Maple fretboards usually have a protective finishing, whereas rosewood and ebony fretboards are unfinished. The products used on finished maple fretboards will damage unfinished woods. You will need to remove the strings of the guitar to clean the fretboard properly, so the best time to do this is when you are changing your strings. You probably won’t need to clean your guitar every time you change your strings (depending on how often you change them!). Once every 6 months should be fine for most people – and even once a year is fine if you don’t play that often. It’s actually bad to clean it too often as the oils in your fingers act as a natural conditioner. But there is also grime left behind which should be cleaned up every now and then. I find it’s easiest to set up on a table or bench and with something to support the neck to stop it from over balancing when you are trying to clean. Right, so after you have removed the strings, you will want to make sure your guitar is protected. 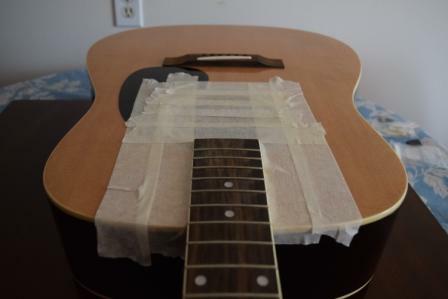 Use masking tape to cover the top of the guitar that runs alongside the fretboard. Use the same tape to cover the soundhole so that you don’t get particles from the steel wool (see below) inside the guitar – this will also protect any magnetic pickups (if you have them) inside the guitar from attracting the steel wool fragments. Before applying the tape it’s a good idea to give the area where you are taping a quick rub down to make sure it’s free of dust. For this I have found the best and easiest way is to use fine grade steel wool. Some people freak when you say to use steel wool on their precious fretboard – but the steel wool you use is very fine grade. 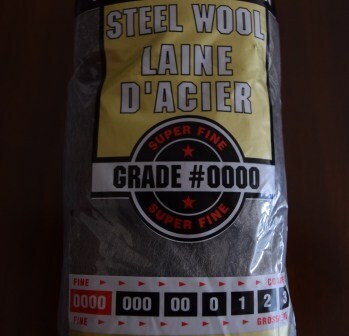 It is very important that you use 0000 grade steel wool. If the steel wool is too harsh it will damage your fretboard. But this very fine grade does a great job for cleaning up the fretboard and the frets at the same time. And it’s very easy to do. Simply run the steel wool up and down the fretboard starting from the first fret and working your way down towards the sound hole. Always do this up and down the fretboard, with the grain of the wood (not width-ways across the fretboard). 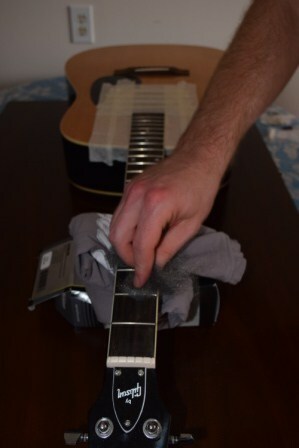 Once you have cleaned the fretboard it’s important that you remove all of the steel wool fibres. Use a soft brush (a soft bristled paint brush works well – provided you haven’t used it for painting!) to brush away all of the fibres before conditioning. Take a cloth – and put a small amount of linseed oil or lemon oil. I try to get a product that is specifically designed for guitars (and that it’s noted that it’s safe and good for the particular type of fretboard that I’m conditioning) so that I can be sure that it will be safe. Put the oil on the cloth not directly on the fretboard. Use only a small amount and wipe it onto the fretboard with the cloth. Once you have wiped it on take a dry part of the cloth or a new cloth that’s dry, and buff off any excess oil. This is something that you can do after every time you play the guitar to avoid it getting dirty. This is of course up to you depending on how clean you like to keep your guitar. 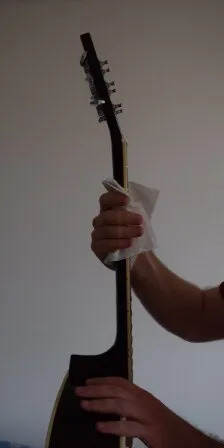 If you do like to regularly clean your guitar – like giving it a quick wipe down after every time you play you only need to do this with a dry cloth – preferably a 100% cotton cloth. An old t-shirt can work fine, particularly if it’s 100% cotton. Try not to clean with the printed parts of the t-shirt – sometimes this can scratch the finish. Every now and then I also like to do a thorough clean. If you don’t clean the top, back, sides and neck regularly you may need to give it a bit more of a clean. Or even if you do clean it regularly sometimes it will need more of a clean and that spot between the sound hole and the bridge may need some extra attention (easier to access when you have the strings off). If so then you can use a mild soap and water solution. Always apply this to your rag or cloth and never directly on the guitar and make sure that the cloth is just slightly damp – not wet. Wipe down the top, back, sides & neck and to make sure there isn’t extra moisture wipe it down again with a dry cloth or dry part of the cloth you are using. If you want to give your guitar that great shine then you might want to polish it after cleaning. Note: It’s very important that you don’t use general furniture polishes and never use waxes or polishes with a silicone base. I like to stick with guitar specific polishes so that I know that I am getting something that isn’t harming the finish on my guitar. The process is pretty much the same as it is for cleaning the guitar. Put a small amount of the polish on the cloth (never directly on the guitar) and wipe over the top, back, sides & neck of the guitar. Now use a dry cloth or dry part of the cloth and buff it all off. Don’t forget the neck too – a nice clean, polished neck can be really nice to play on. While your strings are off the guitar it’s also a great idea to clean the headstock and also to tighten the nuts on the capstan (the parts of the machine heads that hold the strings). You can also tighten the screws in the tuning pegs if they are lose – whilst you can do this when the strings are on too it’s a good habit to get into so that you remember to do it when you do a clean. Thanks so much for reading. I hope this post has taught you something about how to clean your guitar. If you have any questions or anything to add you are very welcome to leave a comment in the comment section below. Hey man. Was reading this article. Really interesting but have you tried The String Cleaner from ToneGear? They make a really cool device that saves you the step of taking off your strings every time you clean them. Thought maybe you want to check it out. Thanks again for the article. Love your website. Thanks for your message. I haven’t checked out Tonegear’s string cleaner – but I will give it a go. Thanks for pointing it out. (unfinished) fretboard. As you point out, the important things are to 1) protect the guitar/soundhole/pickups and 2) rub WITH the grain and not across–again, something woodworkers have been doing for years. As an extra precaution, I like to vacuum off the neck and body afterward with the my vacuum’s soft brush attachment (to prevent scratching the finish), even if I don’t see steel wool anywhere. Few things clean better than steel wool, but you definitely have to add oil to the fretboard afterward. In addition to removing dirt and grime really well, it pulls oils out of the wood too, leaving it a bit parched. Thanks for your input. Appreciate the extra pointers there re oiling afterward and vacuuming the guitar after cleaning, just to make sure that there aren’t any bits left behind. Suggest you try 0000 synthetic wool. May have to internet order it. It does not shred like steel wool. Also ,best not use any silicone based polishes on the finish . If the finish ever needs repairs, it can complicate things. Will the 0000 steel wool hurt the fret board inlays? For example, micarta or mother of pearl inlays?